This is that one model you would regret if missed, Volkswagen finally achieved its dream to create a model that can deliver 235 mpg (1 Liter per 100 kilometers). We are talking about the latest unveil by Volkswagen at the 2013 Geneva Motor show, Volkswagen XL1 2014. 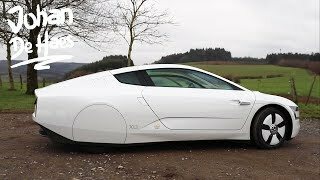 Let us scroll down a little and have a sneak into the review of Volkswagen XL1 2014. 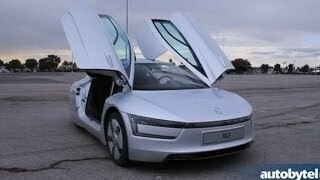 Talking about the interior of Volkswagen XL1 2014 you have some new upgrades in there, the major change in this list is one through the location of seats. This two-seater now places its seats side by side unlike the one featured in its concept featuring a tandem arrangement. It comes with a two-spoke flat bottom steering wheel with a round ‘Volkswagen’ logo in its center. Dashboard is quite clean with selected control mounted over it in center while the sides are mounted with air vents carrying traditional looks. There is enough legroom and headspace, even for those with a 6-feet height. In all the entire interior of Volkswagen XL1 2014 to us looked simple with all what you might need over a day to day ride. Exterior of Volkswagen XL1 2014 is that creation where you can say company stood upto the expectation they created through concept versions. Volkswagen XL1 2014 is made from lightweight carbon-fiber reinforced polymer. It is housed in exterior with LED headlamps that look amazing sitting beside its tiny elongated grille. Volkswagen XL1 2014 comes with scissor opening doors that add a remarkable glory to its entire looks. Down below in the front end is an elongated air intake maintaining proper flow of air while at the rear company has packed the wheels entirely, in order to prevent drag. Also new for Volkswagen XL1 are the e-mirrors in place of traditional mirrors, this new inclusion send the images to the center display screen mounted on dash and thus serves the purpose by making the exterior look clean and luxurious. This is another section where Volkswagen XL1 2014 takes the badges, in fact we should say the most important and enlightened through its hybrid drivetrain that joins an 800cc two-cylinder engine delivering 48 hp with an electric motor which makes total output of 27 hp and combined they pair to a seven-speed dual clutch gearbox. 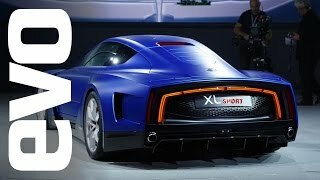 With its total output of 75 hp it can finish the 0-62 mph sprint in 12.7 seconds while the top speed of Volkswagen XL1 2014 comes at 100 mph and this all at out-of-the-world fuel economy of 313 mpg.